We took a bunch of pictures at my great-aunt’s funeral. 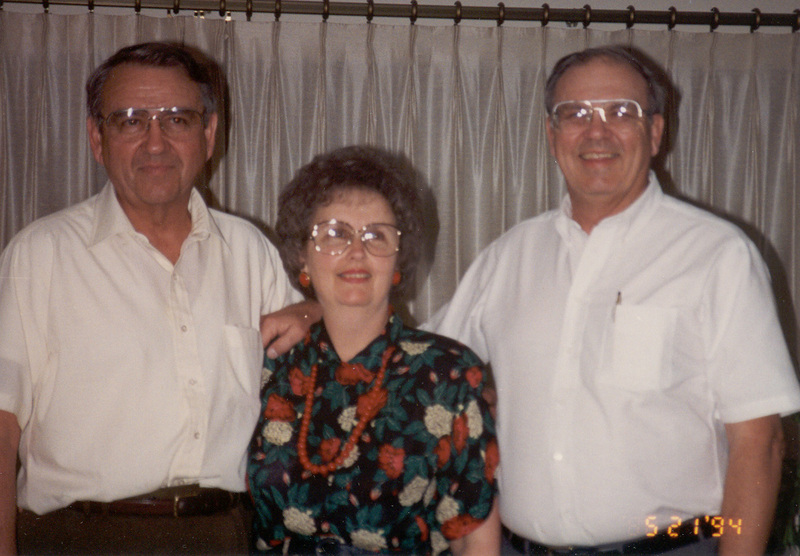 This one of my Dad with his brother and sister was one of the best. My aunt is smiling so nicely at the camera. I’m not sure when she realized that my Dad did not have his arm lovingly draped around her, but was engaged in a shoving match with his brother. Those two guys spent their life as two peas in a pod looking for trouble. They were the ones that as teenagers decided to net a beaver and drag it into the boat to see what would happen. The beaver started slapping the bottom of the boat and nearly ripped it out before the two boys got it back out again. In college, my Dad spent time racing cars. When he got in an accident, he hid it from my grandparents with his brother’s help. So this behavior was not a surprise to any of the children nor was it a surprise to my aunt. Some of the grandchildren were probably surprised, but then they didn’t grow up with the holiday dinners where one of these guys eat in the kitchen with the children only to in trouble with my great-aunt for letting us get too rowdy. They were supposed to keep an eye on us, not contribute to the trouble. Word for tomorrow – CONCLUDED. If you prefer to work ahead, see the list for the week under “A Word A Day”. Love this!! Thanks for the great sibling story! You’re welcome! I think the grandchildren were shocked at their grandfathers getting into a shoving match. The children and my aunt certainly were not. You only had to take one look at my Dad’s face to know he was up to no good when the camera started clicking.